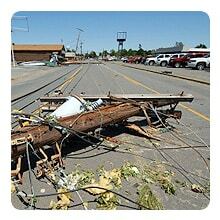 tornado electric safety tips,storm electrical safety tips — York Electric Cooperative, Inc.
Watch out for loose or dangling power lines, and report them immediately to the proper authorities. Be sure all electric and gas services are turned off before entering buildings for the first time. Watch for electrical shorts or live wires. Don’t turn on any lights or appliances until an electrician has checked the system for short circuits. Electric motors in appliances that have been flooded should be thoroughly cleaned and reconditioned before they are put back into service.